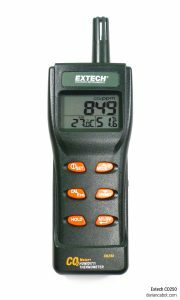 The Extech CO250 is a relatively cheap handheld air quality measurement device with decent features. It measures carbon dioxide (CO2), dry-bulb temperature, and relative humidity, and also provides calculated dew-point and wet bulb temperatures. After some searching I found what seems to be the OEM device which Extech rebadges. The original device seems to be a Senseair pSENSE RH. I was initially looking at the Testo 315-3 but was put off by the price as I won’t be using it often (granted the Testo device also measures CO). Instead, I decided to go for this Extech for a third of the price, and have been very happy with it’s performance. 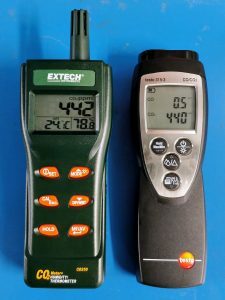 I actually borrowed a friend’s Testo 315-3 and compared the two devices side by side (see photo). The Extech is just as accurate as the Testo (I tested from about 400 to 1000 ppm). 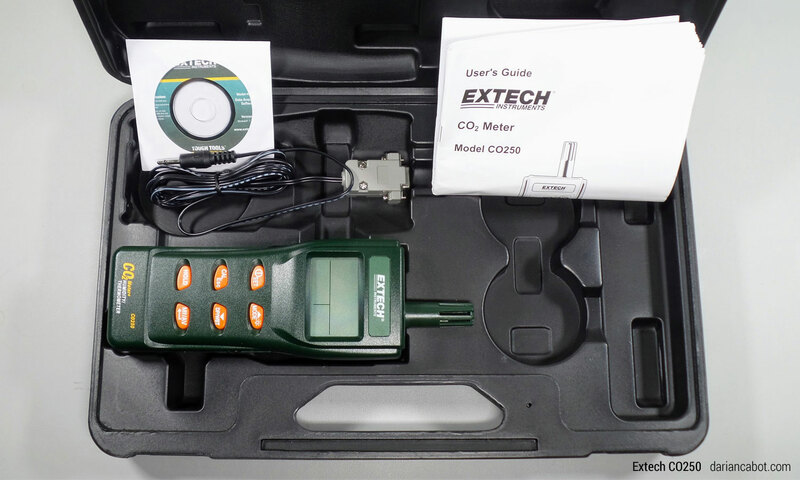 The Testo is slightly faster to react on increasing CO2 levels (by 5-10 seconds), but the same reaction time to decreasing CO2. 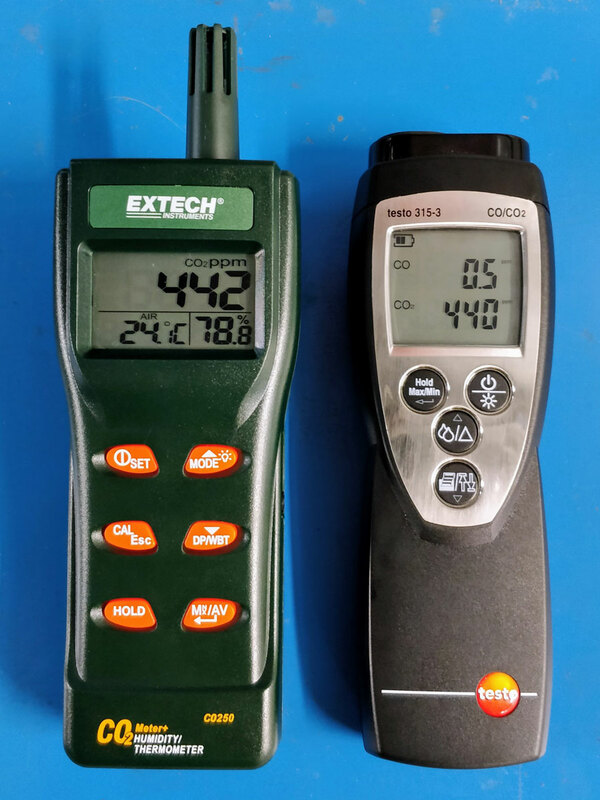 Also the Extech has better 1ppm resolution, whereas the Testo has 10ppm resolution. As for long-term accuracy and reliability; time will tell I suppose. The Extech has a RS-232 serial cable for data output which was another deciding factor for me. 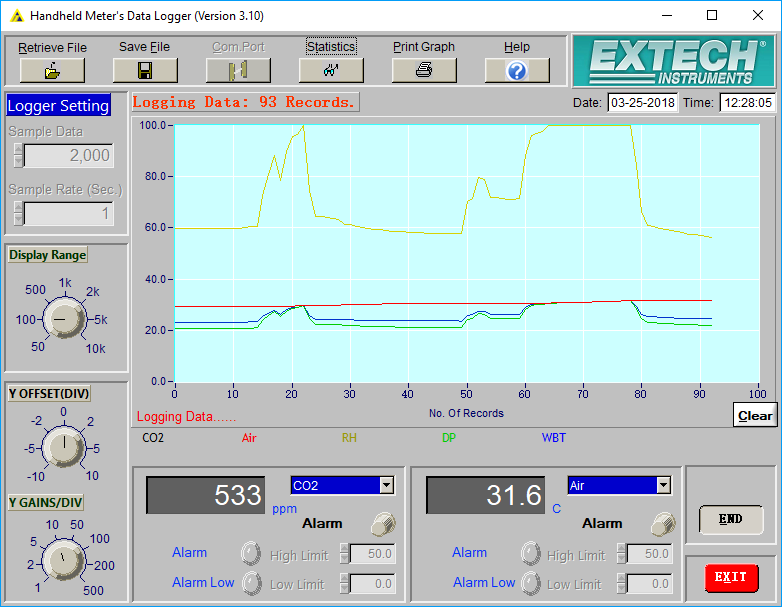 Each second it outputs live readings of CO2, dry-bulb temperature, relative humidity, dew-point temperature, and wet-bulb temperature over it’s serial connection. The software that came with it is the typical old and clunky Windows software, but more on that later. The meter came in a hard plastic case with an RS-232 (DB9) cable, software mini CD, and manual. It doesn’t include a power supply, so I bought one locally for cheap. You’ll need a 9VDC, 1A supply. I found that a 4.0×1.7mm power jack fit well (centre-positive). I’ve managed to squeeze everything (including the power supply and USB to RS-232 cable) in the case. Also, it must be said that the device looks like a toy CB radio or ancient Nokia phone!! Not the sexiest looking device, but that matters little for my work. The included Extech 407752 Windows software is rather old and clunky, but functional. It allows for data recording, displaying on a chart, and saving this data to a text file. Interestingly the installer includes a bunch of Nation Instruments software libraries, perhaps this is based on NI software? There is a histogram feature included that shows some statistics for each measurement. 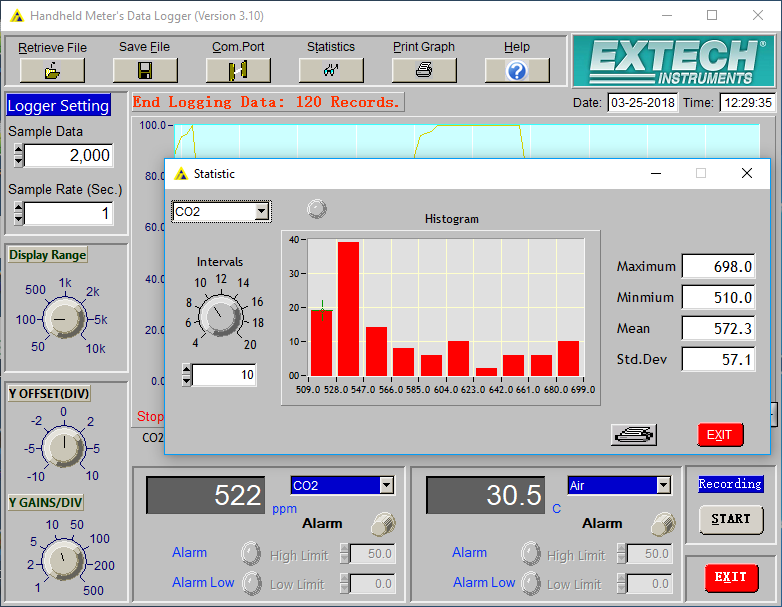 I let the Extech software run for a couple minutes logging readings, then clicked the Save File button. This allowed me to save the logged data to a text file. In Microsoft Excel 2016, I imported the saved text file directly and it managed to import everything correctly. I then selected the time and readings columns and clicked insert line chart. All this was done in a few clicks and no messing with settings or formatting (see the screenshot below). So the good news is, it’s very easy to get logged data into Excel! 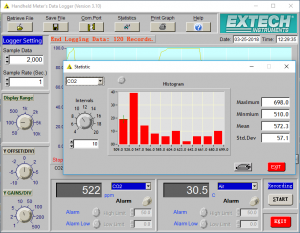 I have previously developed Java libraries for test equipment (see Protek 608, for example). 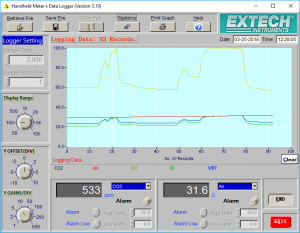 I like developing my own software, especially in Java, as it’s cross-platform compatible and allows me to use a Raspberry Pi to log data long-term. I’ve decided to do the same with this Extech CO250, so in future posts I’ll detail the RS-232 connection and serial protocol, and develop some software. Stay tuned! Hardware and software engineer with experience in product development and building automation. Director at Cabot Technologies and Product Manager at NEX Data Management Systems.